You can set up the system to create recurring invoices for sales orders. These can be created on a weekly, monthly, quarterly or Yearly basis. 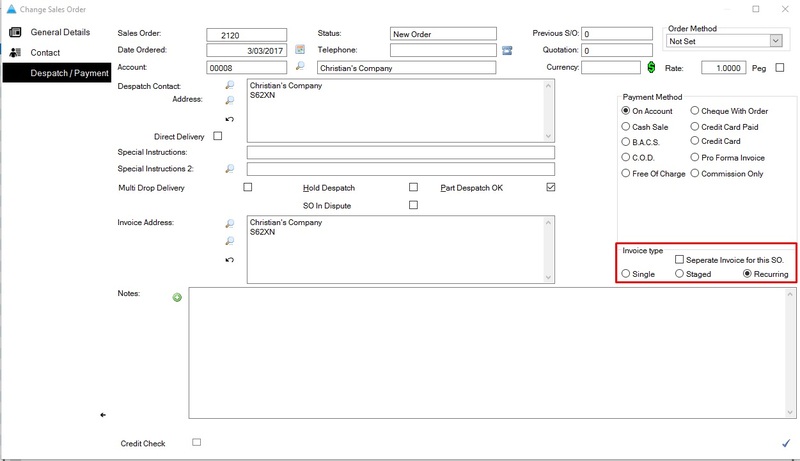 Create the Sales order that will be the base of the recurring invoices as a normal Sales order. 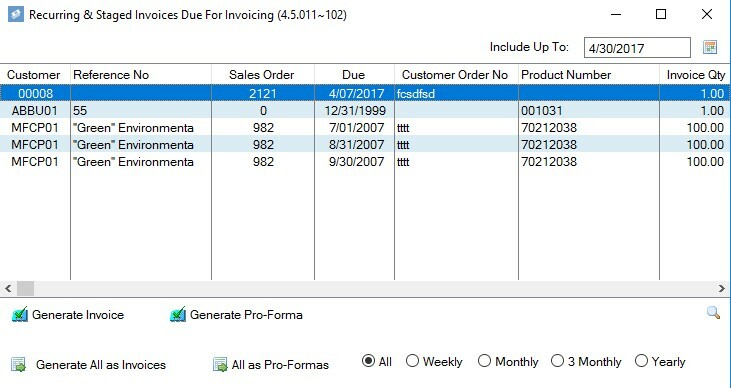 Within the Recurring Invoices screen create a new Recurring invoice by clicking the plus button in the bottom right hand side corner. This will bring up the Recurring Invoice entry screen as shown below. Add the Customer details for the corresponding Sales Order created earlier and enter the sales order number as well. This will bring through all the details on that order to create the invoice details from. Once you are happy with the details, click the tick to save. To generate the recurring invoices you do this from within the Sales Invoicing screen. There is a ‘recurring Inv’s’ option at the bottom. Click on this to bring up the Recurring Invoices screen. This will display all recurring invoices due up to the date entered in the Include Up To box. You can generate all or individual invoices from here. And then process the invoices as normal from the Sales Invoices program.